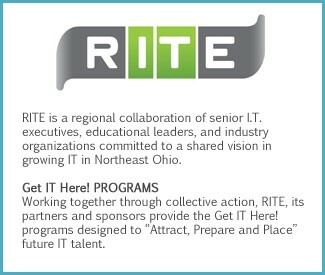 The Regional Information Technology Engagement Board (RITE) is pleased to announce on behalf of its partner TECH CORPS that applications are being accepted for this year’s array of Free Coding Camps for rising 9th through 12th graders. Please help us spread the word across the region. Students from NEO are eligible to apply. This Year we will also host a Cyber Security Camp -This camp will introduce high school students to the concept of Cyber Security. Through the implementation of various hands-on labs and challenges, students will learn to recognize and find cyber security vulnerabilities, as well as strengthen cyber security practices, all based on real world circumstances. The interest in Information Technology/Coding in Northeast Ohio has been tremendous – we are delighted to announce that all coding camps were filled to maximum capacity last summer. The camps will provide 40 hours of rich-technology programming that puts participants in the role of creating and designing with technology. In addition, students will engage with IT professionals from the sponsoring companies. No previous programming experience required. Applications are open for this year’s Summer Coding Camps delivered by RITE and TECH CORPS in partnership with RITE Higher Education partners and our corporate sponsors. Applications are due Saturday, April 30th! Find more information and links to the online application and teacher recommendation form. Camps are free and space is limited. Happy Camping and Coding! This entry was posted in Building Community, Technology. Bookmark the permalink.